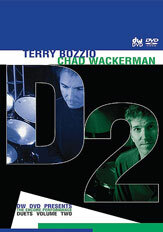 DW DVD presents Terry Bozzio and Chad Wackerman in their much anticipated encore performance. Recorded following their sold-out multi-city tour, the two drumming legends are captured through dramatic, multi-angle camera views. Complete with insightful interviews and active graphics explaining their unique melodic approach to drumset, this DVD is a must-have for every drumming enthusiast's video library.